This Contender 30 ST has both a deep-V, and steps. But, just what does that mean? 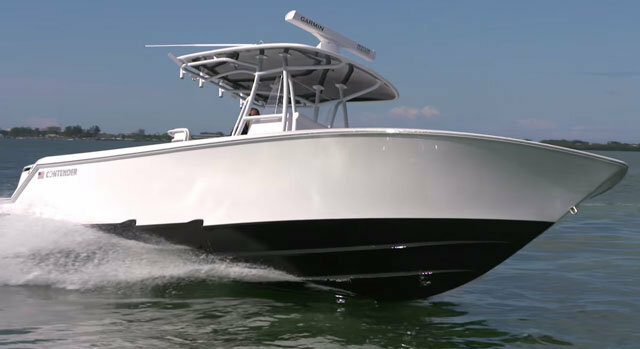 When it comes to boat hulls, there’s a whole lot of misinformation out there. What’s a deep-V? Ask 10 different people, and you’ll get 10 different answers. What do steps do in a hull bottom? Again, everyone seems to have a different opinion. There’s just one problem: in reality, only one of the answers or opinions you’ll get are correct. Part of the problem comes from manufacturers who are a bit overzealous with their marketing claims. And part comes from the fact that these seem like simple terms. After all, “deep-V” is self-explanatory, right? Um… not really. So if you’re not 1,000-percent sure you know what technically constitutes a deep-V—or for that matter, where to draw the line between deep-V and semi-V, or what a tri-hull is—check out this boating basics video, Lenny’s Boating Tips: Boat Hull Basics. Now, let’s get a bit more complex and tackle steps. Stepped hull designs aren’t as new as a lot of people think (the concept dates back over a century) and they don’t work in the way they’re commonly explained. You remember hearing that a step creates lots of bubbles running aft, that break adhesion to the water? Um… not really. If you want to get the facts, check out Lenny’s Boating Tips: Stepped Hulls. Okay folks – have we got it straight? I sure hope so. These Boating Tips videos are going to be a regular, weekly thing (a new video goes onto YouTube every Tuesday) so if you’re looking for more info about boats, be sure to check ’em out. Next time we’ll cover boat trim, and after that… who knows?